One of the scariest moments for a parent is when you go into your toddler’s room to discover that they are no longer in their crib. How did they do it? How long have they been free? What have they been doing since they have escaped? Did they get hurt? These are all the concerns and questions that ran through my mind when I discovered that my daughter had climbed out of her crib! Is my child ready for a real bed? What kind of bed should I get for my toddler? When this happens, it puts you in a dilemma of “What do I do now?” Depending on the age and development of your baby or toddler, they might not be ready for a real bed just yet. However, you don’t want to take the chance that they will get hurt by escaping their crib at night. 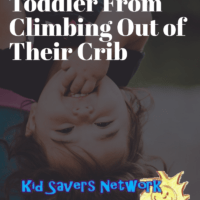 Here are some options to consider when your toddler figures out how to escape from their crib! A sleep sack is an excellent choice for babies who are attempting to climb out of their cribs. 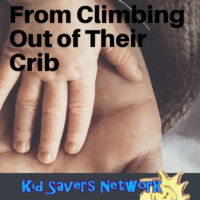 Even though most babies don’t start to climb up and over their cribs rails until after their 1st birthday, sometimes children as young as 9 months can learn to push and pull themselves up and over the bars. 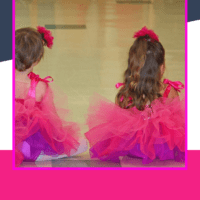 Some babies of this age develop mobility sooner, and it is possible for them to learn this troublesome skill. Sleep sacks zip to enclose around the baby’s feet and legs. They’re roomy and comfortable but still prevent them using their feet and legs for climbing. It’s just a little restriction which might be sufficient enough to discourage them from climbing. Crib Tents offer a solution to keeping your toddler or baby inside of their crib. They basically are sturdy, pop-up tents that fit right into the crib. The breathable, polyester mesh fabric fits snuggly against the rails, which means that your child can’t get stuck in the bars anymore. It closes securely with an auto lock zip, which keeps your toddler securely inside of the crib. The crib tent doesn’t have any loose netting, so your child can’t get tangled, and they are high and sturdy enough so that they can’t be pulled down. Another great feature of a crib tent is that it keeps your cat out of your baby’s crib! It will also keep other children from throwing toys inside of the crib, or your baby from throwing his toys out of the crib! You need to be aware that some crib tents are not safe. However, after researching the various models we found this one has many good reviews and safety features. Most cribs have the option to lower the mattress or raise the rails of the crib. Many of us start off with the mattress as high as possible. This makes it easier to care for our infant. However, when the baby gets older, it can be easy to forget to lower the mattress. 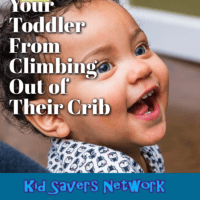 This simple step can make it harder for your toddler to reach the top of the rails to pull himself up. This might give you some additional time before switching to the child’s bed! 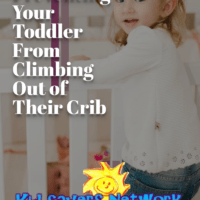 Safety comes first, and if you can’t stop your toddler from climbing up and over the crib bars, then it is time to make the move to a child’s bed. Some questions and concerns naturally come along with this transition. If your child is over the age of 2, then yes, he or she should be ready for a real bed. 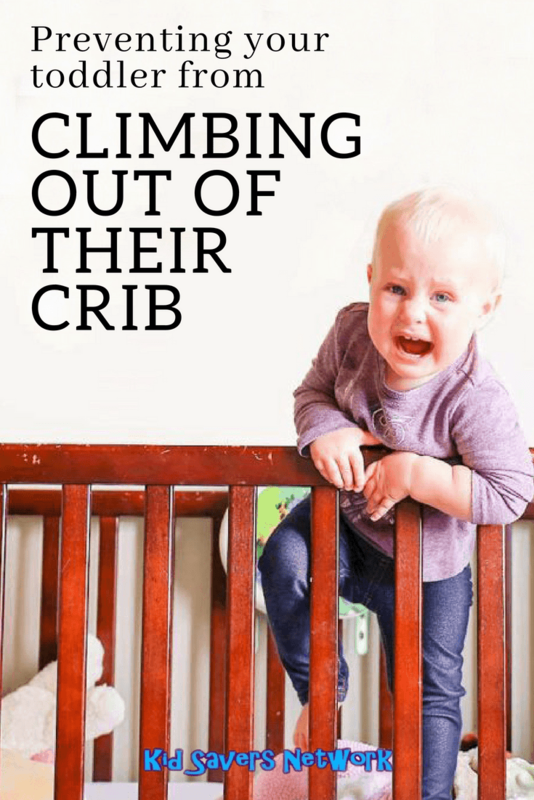 At this point, your toddler won’t be comfortable in a crib anymore ─ hence their escape tactics! For babies under a year and a half, it can be a little more tricky. It really depends on their development. If you think that a sleep sack, lowering the mattress or a crib tent will work, then try those options first. If you just can’t keep your child in the crib anymore, then it’s definitely time for the move! There are several options in which you can choose from when it comes to a new bed for your toddler. Toddler beds– There are some really good toddler beds on the market. Some of them come in styles like a car for boys or a princess bed for girls. Convertible Cribs– Convertible cribs are a great solution for the transition from a crib to a bed. The bars remove on one side, offering the freedom of a real bed, but still provide support on the other three sides. When you child is old enough, you can easily remove all of the bars to convert it into a regular bed. 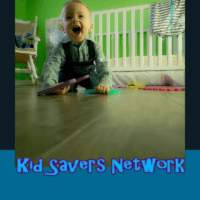 A single bed with support rails– If you don’t want to splurge on a convertible crib or a child’s bed, just to have to buy another bed down the road, go for a single bed with rails. The rails will keep your child from falling out of the bed, but won’t restrict your child from staying in the bed. The rails are removable when your child no longer needs them. For more great “transition” toddler beds, check out our page on toddler travel beds here. We know what it feels like to find out your toddler has climbed out of their crib. It can be scary and stressful! But, try to remember that this is all part of growing up, and many toddlers try to escape from their crib. It shows that they are developing properly both mentally and physically, so try to look at the situation as a positive one! Finding the right solution can be trial and error. We hope that our options will help with your toddler’s transition to a real bed!